Gavvalu board (or use a fork or clean comb) | Press each piece and release for the pattern to be formed. 1. Place flour, baking soda in a bowl and knead into a dough with very little water. It should be firmer than a chapati dough. Cover and let it rest for 1 hour. 2. Divide the dough into 4 portions. Gently shape each ball into a cylindrical roll and cut into small pieces. Press on a gavaalu board (shown in the picture above) or use a fork/clean comb to make the patterns. Spread them on a newspaper or flat surface and dry for 30 minutes. 3. Heat enough oil for deep frying and fry the shells in small batches until they are light golden brown. Drain excess oil on paper towels. Set them aside. 4. In a thick bottomed pan, add sugar, water, ghee and cardamom powder. On low heat, let the sugar dissolve and a thick syrup is formed. 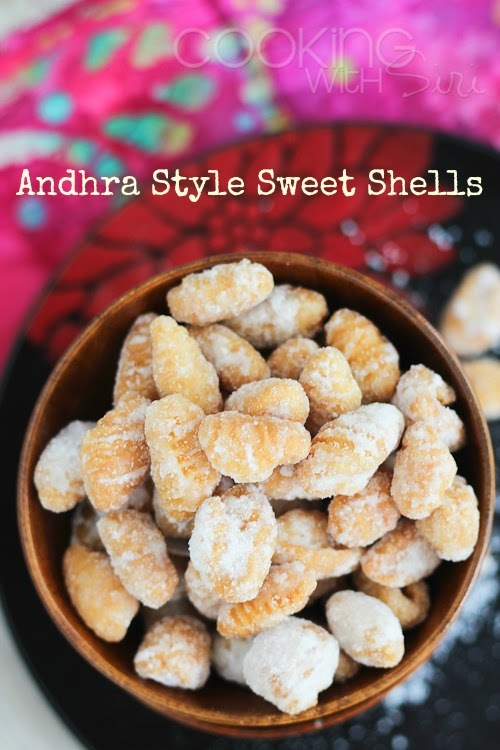 Add the entire lot of fried shells and mix immediately so that the sugar syrup is evenly coated.